Cocktails & Conversations: Washington, D.C.
Join fellow Anteaters for Cocktails & Conversations at the National Press Club, the world's leading professional organization for journalists. 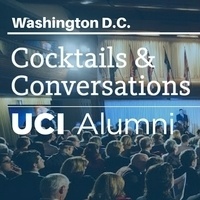 Enjoy an evening of networking over heavy hors d'oeuvres and libations and hear a conversation between UCI vice chancellor for research Pramod Khargonekar, Ph.D. and distinguished alumna Susan Old '81, Ph.D., the deputy director for the division of extramural activities at the National Institutes of Health. Don't forget to bring your fellow Anteaters along too! Since it's founding in 1908, every U.S. president since Theodore Roosevelt has visited the National Press Club, and all since Warren Harding have been members. Most have spoken from the club's podium. Others who have appeared at the club include monarchs, prime ministers and premiers, members of Congress, Cabinet officials, ambassadors, scholars, entertainers, business leaders, and athletes. Registration: Ticket includes heavy hors d'oeuvres and libations. Walk ups are welcomed!